One of the eight Basilicas in India, built in gothic style by the Portuguese with beautiful paintings on the ceiling. Santa Cruz Basilica, a Roman Catholic Cathedral located at K.B Jacob road in Fort Kochi, is one of the finest and impressive churches in Kerala. It is a place of devotion as well as a center of historic significance, endowed with architectural and artistic grandeur and colours of the gothic style. Located close to St. Francis Church it is the 'capital church' of the diocese of Cochin. The history of Santa Cruz Basilica begins with the arrival of Portuguese missionaries along with the second Portuguese fleet under Pedro Alavarez Cabral on December 24, 1500. The Kochi king Godha Varma I received them very warmly. This caused the Zamorin of Calicut to declare war against Kochi. But the Portuguese army under Commander Francesco de Albuquerque who reached Kochi in 1503 defeated the enemies of the King of Kochi and in return he gave them permission to built a fort in Kochi. In 1505, Francesco de Almeida the first Portuguese Viceroy got permission from the Kochi Raja to built a church edifice using stones and mortar which was unheard of at that time as the local prejudices were against such a structure for any purpose other than a royal palace or a temple. The foundation stone of the Santa Cruz church was laid on May 3, 1505, the feast day of the ‘Invention of the Holy Cross’, hence the magnificent edifice when completed was named Santa Cruz. This church was located on the eastern side of the present Children’s Park, Fort Cochin. 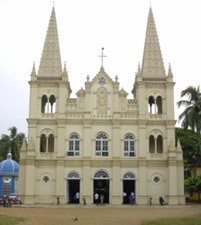 In 1558, Pope Paul IV, raised the Santa Cruz church to the status of a Cathedral along with the erection of the Cochin diocese as the second diocese in India. Afterwards when the Dutch conquered Cochin in 1663, they destroyed all Catholic buildings. Only the St. Francis Church and the Cathedral escaped this fate. The Dutch made the cathedral their arms storehouse. Later it fell into the hands of the British who demolished it when they took over Kochi in 1795. One of the decorative granite pillars of the destroyed Cathedral is still kept as a monument at the southeastern corner of the present Basilica premises. About 100 years later, Bishop D. Joao Gomes Ferreira (1887 - 1897) who reached Cochin took initiative to erect the Cathedral and commenced the construction but it was the next bishop, D. Mateus de Oliveira Xavier (1897 – 1908) who completed the edifice. The cathedral was consecrated on November 19, 1905 by Dom Sebastiao Jose Pereira, Bishop of Damao. Considering its antiquity, artistic dignity and historical importance, Pope John Paul II raised the Cathedral as a Basilica through a special decree in 9th December, 1984. The Church has two lofty spires and a remarkably bright, white-washed exterior and a pastel-colored interior. The interiors of the church are mostly Gothic, with the main altar decorated by the famous Italian painter Br. Moschini S. J. and his disciple De Gama of Bangalore. The columns decorated with frescoes and murals, the seven large canvas paintings on the passion and death on the Cross, especially the painting of the Last Supper, modelled on the famous painting of Leonardo da Vinci and the beautiful stained glass windows add to the artistic grandeur of the place. The paintings that adorn the ceiling depict scenes from the life of Christ. 5.30 a.m., 6.45 a.m, 8.00 a.m, 9.05a.m and 4.30 p.m. (in English).